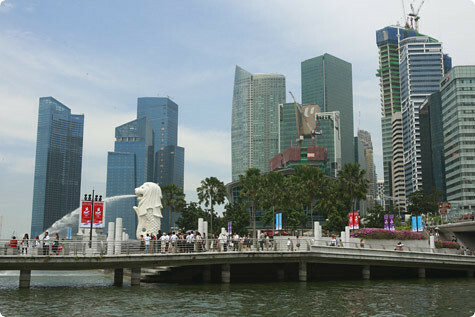 At last, we’ve reached the final destination of our Asian odyssey: Singapore. Actually it’s a bit misleading to call it the final destination since on our trip it was actually first, middle and last. Not only were we there longest of any place on the trip, Singapore was responsible for the trip happening in the first place. Well, technically it was my dad and stepmom who were ultimately responsible, having arranged a house exchange with an expat couple in Singapore for the month of July and inviting us to join them, but if it hadn’t been Singapore we probably would have spent more than 1/16725th of a second deliberating before saying WE’LL BE THERE!!!. I don’t know about you, but when the opportunity presents itself to hang out rent-free for a while in a place you’ve always wanted to go, you move whatever mountains are standing in your way to make it happen. Believe me, nothing was going to get between me and the opportunity to live like a local for a few weeks in what might be one of the most food-crazy places on the planet. Now, I’m going to cut right to the chase: if there is such a thing as a gastronomic paradise on this planet, I’m going to have to put my vote in for Singapore. Yes places like France and Italy and Vietnam and Morocco have amazing food, but they have their own kind of amazing food. Singapore has every kind of amazing food. You want a paper-thin, charred-bottomed pizza that would make a pizzaiolo in Napoli proud? Singapore has it. You want sushi made from fish that six hours ago were gracing the auction blocks at Tokyo’s Tsukiji market? 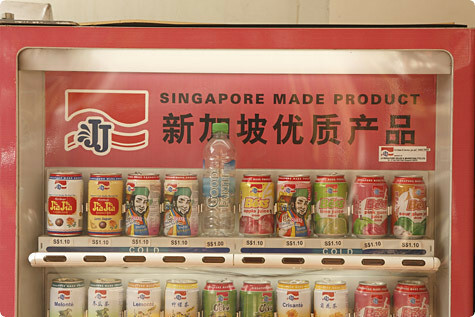 Singapore has it. You want to follow up a $5 lunch with a $500 dinner, and have both of them be meals you’ll relive for weeks? Singapore has it. You want to be able to stop any random person on the street, ask them for a restaurant recommendation and know you can trust the response? 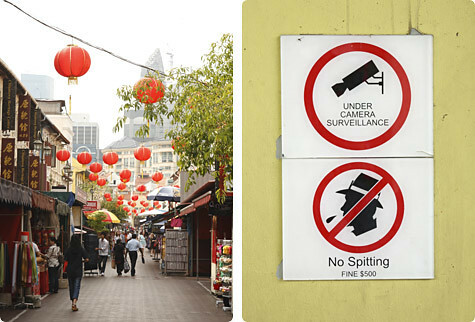 Only in Singapore. This island has somehow bred a standard of food so high—and a citizenry so discerning—that it’s almost impossible to have a bad meal here. I’m sure it’s happened to somebody somewhere, but it sure didn’t happen to us. In fact, we had so many incredible food experiences in Singapore that one post couldn’t even begin to do them justice. Five posts might begin to, but since probably neither you nor I have the patience for that, I’ve done my best to identify the highlights and over two posts will be giving you a countdown of the twenty things I loved most about this little country. But don’t think for a minute this is all there is. Multiply this by about fifty quadrillion and you might be closing in. Curry puffs are proof (if any were needed) that not all Asian food can be described with the terms ‘light’ and ‘healthy’. It’s also proof that if you think you don’t like something (i.e. canned sardines), chances are you just haven’t tasted them in the right form. The Malay/Singaporean take on the Indian samosa, curry puffs are deep-fried crescents of flaky shortcrust pastry enveloping a spicy filling of either curried chicken and potatoes (the classic) or sweet and spicy sardines (called a sardine curry puff or just a sardine puff). I tried various versions of curry puffs around town, but to my tastebuds none could hold a candle to the sardine version from Old Chang Kee, essentially a fast-food chain peddling deep-fried snacks. The crust was crisp and flaky, the sardines were juicy and tender, and the seasoning was the perfect balance of sweet, tangy and chili-hot. I’m already working on a DIY version. 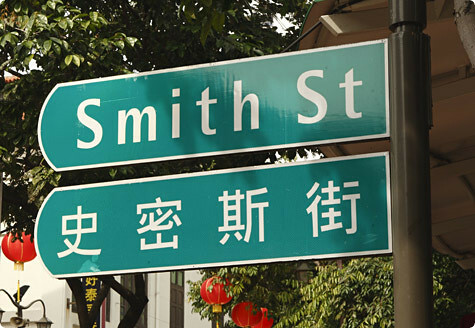 Otherwise known as the Arab Quarter, this colonial neighborhood is one of the few in Singapore that retains some old-world charm. 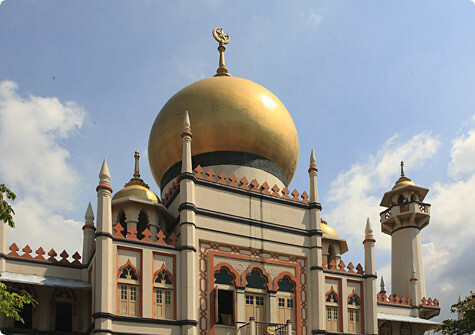 Originally the home of the Malay aristocracy, under the Raffles Plan of 1822—which effectively segregated the colony into different ethnic communities—it became the designated settling ground of Muslims, ethnic Malays and Arabs. Today the narrow lanes of beautifully-preserved shophouses are home to small businesses selling everything from Persian carpets to souvenirs, along with one of the most diverse collection of eateries on the island; here you’ll find everything from traditional Malay cakes to Lebanese mezze to charcoal-grilled Turkish kebabs. That said, when hunger strikes your first port of call should be Zam Zam (below). 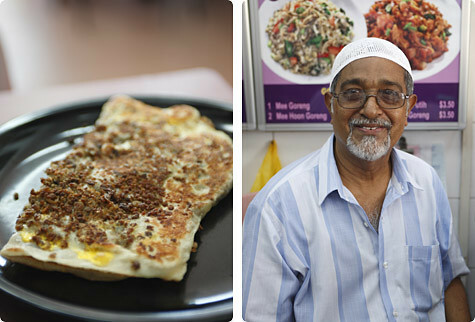 I would have gone to this Arab-Quarter eatery for the name alone, but it’s also the first place any Singaporean recommends when you mention you want to try one of the country’s best-loved snacks: the murtabak. 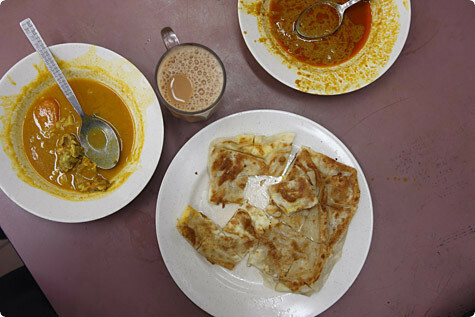 A Singapore original, the murtabak is similar in concept to the Indian paratha, known here as a ‘roti prata’—a flaky flatbread, lubricated with oil and cooked on a griddle. The murtabak does the roti prata one better, though, and includes spiced minced lamb or chicken and egg between the layers. Served with a bowl of thin curry sauce and a plate of cucumbers and ketchup, this is true fusion food, and a great hearty breakfast or light lunch. 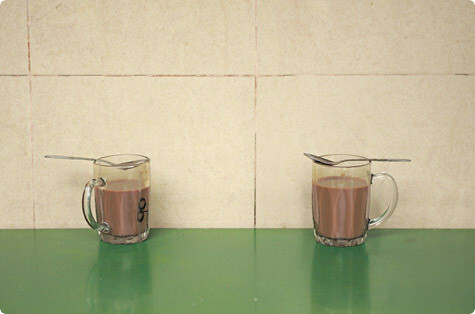 Zam Zam does plenty of other kinds of food, including various kinds of curries and noodle dishes, but don’t get too distracted: murtabak is the main event here. p.s. Locals have an interesting way of eating this: they cut the bread into pieces on their plate, ladle the curry sauce on top, and dive in with a fork. 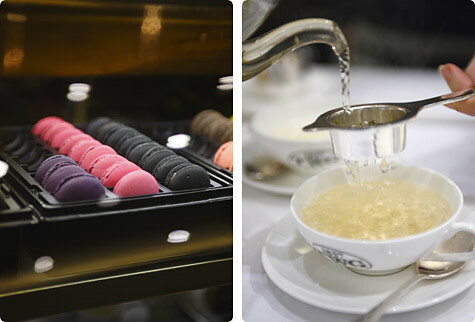 And speaking of tea, if you’re interested in expanding your tea horizons there’s no better place to do it than the new, über-gorgeous TWG Tea boutique and café in the Ion Orchard shopping center. Taking inspiration from the great Parisian tea salons, everything about this glass-walled enclave oozes style and class. We spent a fascinating couple of hours here being given a tea tutorial by one of the owners, a glamorous American expat named Maranda Barnes. She talked us through their menu which features more than 1000(!) different teas and blends including offerings from India, China, Korea, Vietnam, Burma, Rwanda, Georgia, Iran and Cameroon, and led us on a tasting tour of some their more unique offerings, like green tea with lotus flowers, black tea with caramel, and a spicy and complex ‘Singapore Breakfast’ tea. While the teas were truly exceptional, what really got me salivating were the edibles on offer, namely a range of incredible French pastries flavored with their teas. The macarons in particular were some of the best I’ve ever had, in flavors like chocolate-Earl Grey, Moroccan mint (with both mint tea and fresh mint) and double-caramel, with caramel tea and a salted caramel filling. And that’s not to mention their hauntingly-perfumed financiers, cakes and signature ‘Singapore Surprise’, a tart featuring fresh raspberries and a vanilla-bourbon tea-infused crème brûlée—all were to die for. Singapore may be the land of the spotless, air-conditioned shopping center, but thankfully some of the predecessors to the mall age are still alive and kicking. Visiting a wet market (so-called because due to the nature of the goods on sale the floors are often wet) is a fantastic way to get a feel for the Singapore of times past, not to mention gawk at some of the most amazing displays of sea-life, meat and produce you’ve probably ever seen. 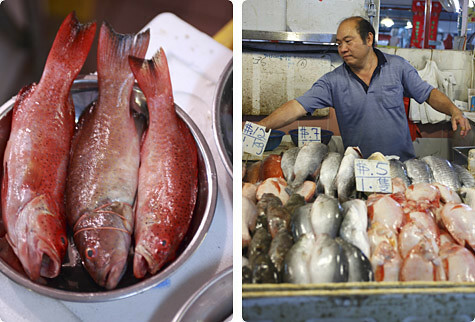 Two that we visited really stand out: the Smith Street Market in Chinatown, which had the most awe-inspiring selection of fish and seafood I’ve ever seen (including live frogs and turtles…! 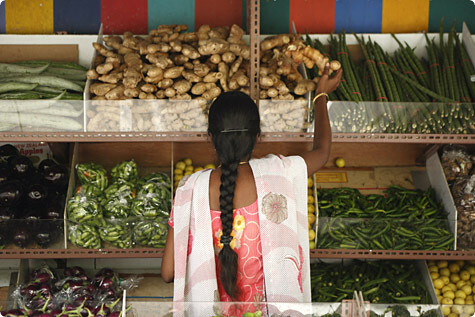 ), and the Tekka Market in Little India, where you can find anything and everything subcontinental and Malay. And speaking of Little India, it definitely deserves a mention here. Nowhere near as polished and quaint as the Arab Quarter, Little India feels real: from the sari-clad women haggling over bitter gourd and eggplants to the dank, dim shops selling everything from cookware to fabrics to the dozens upon dozens of restaurants offering cuisine from every corner of the country. 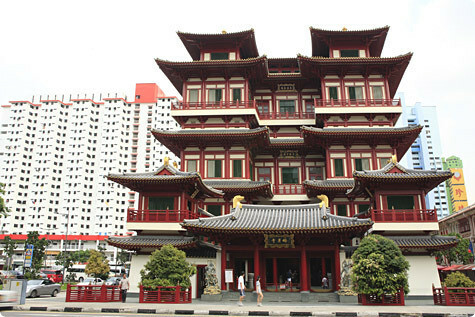 It’s one of the most crowded, chaotic, rough-around-the-edges neighborhoods in Singapore, but that only adds to its charms. Buy yourself a piece of barfi from a sweet seller in the bazaar (not forgetting to say a silent prayer of thanks for Singapore’s iron-clad hygiene laws) and just explore. 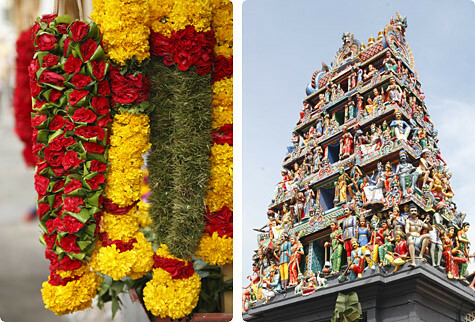 While there’s no shortage of amazing food in Little India, there’s one iconic experience no one should miss. The restaurant Banana Leaf Apolo has been attracting locals, tourists and even the odd celebrity or two (there’s a picture of Mel Gibson on the wall) for the better part of 40 years. 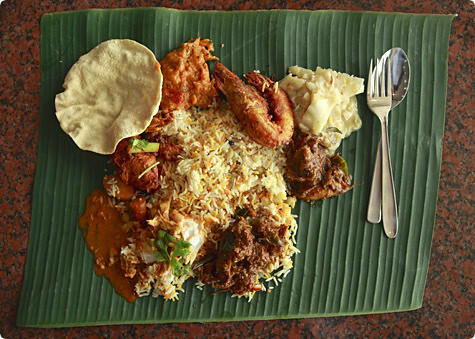 Their claim to fame is first of all the method of serving, which eschews plates for large pieces of banana leaf. Aside from the positive environmental aspects, it’s surprisingly cool to eat off a leaf (who knew?). 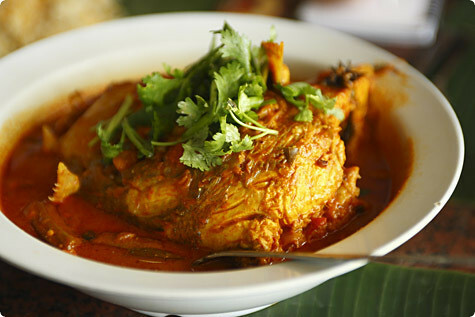 Their second claim to fame is their fish head curry, considered to be among the best examples of this popular Singaporean take on a South Indian favorite. Hot, sour and quite fishy, I’m not quite sure what the advantage is of having the whole head bobbing around in there, but it sure is tasty. I talked a little about Nyonya or Peranakan food in my Penang post. Singapore is home to the southern style of Nyona food, featuring Indo-Malay influences and richer, sweeter flavors. This is exactly the kind of food you’ll find at one of Singapore’s newest and most exciting restaurants, Candlenut Kitchen. Chef Malcolm Lee is something of a wunderkind, having won a Miele scholarship, charged through culinary school and promptly opened his own cozy little restaurant as soon as he got out, aged only 26. 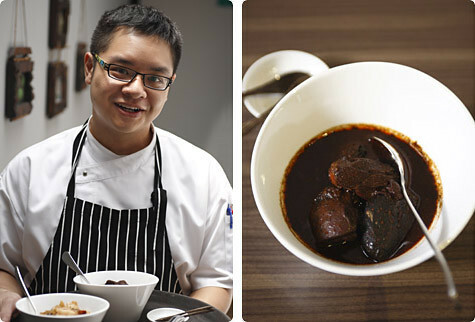 His take on Peranakan cooking is for the most part traditional, but important to him is that things are ‘done right’, in other words, as they were done for generations before convenience started being winning out over flavor. This attention to detail shows in the wonderful depth he achieves in dishes like Ayam Buah Keluak (chicken braised with inky-bitter Indonesian ‘black nuts’), Ngoh Hiang (crispy beancurd rolls filled with pork, prawns, mushrooms and water chestnuts), and Sambal Petai with Prawns. Where he deviates from tradition is with dessert, offering plate-lickers like black rice ice cream and kueh bingkah (a moist tapioca-flour cake) with coconut mousseline. Come hungry. I discovered fresh lime juice in Kampong Glam – the little eatery that we stumbled upon seemed to serve nothing else, so that's what we ordered. I didn't miss white wine for the rest of our trip, as this is pure and utter deliciousness. First time I'm visiting your blog via another foodblog's links and I was completely (pleasantly) surprised to see Singapore as the most recent post! I'm a Singaporean living in London right now, and boy am I missing my food paradise back home. Your pictures are making me drool and I can't wait to see your top 10 list! Definitely coming back and I'm sure there are tons more food you can sample that you didn't! Ok…so I hit your post cos my friend eunice shared it on her FB…and I was thoroughly impressed by what you wrote. Next time you come, email me and let's have ourselves a storm of a meal. I'm expecting Crabs (done many styles) , satay and much more in your next post. Keep on eating and writing! Mmmm. Singapore. 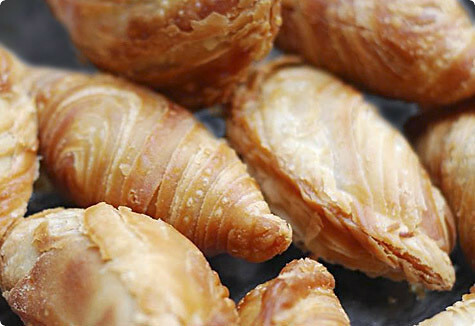 I want sardine puffs. This is the kind of thing I read about Singapore a lot and it's never an opinion I've agreed with. I grew up there and have eaten some pretty poor (hawker) meals: greasy, oily, gristly and all-round depressing. Obviously there's been some incredible food in expected and not-so-expected places, and I miss roti prata like nothing else. Roti prata with their sweet tea is amazing (teh-O is tea without milk but still sweetened). Banana Leaf Apolo is often considered overrated though I do miss eating off banana leaves. When I was little it was quite standard to eat off banana leaves in Indian restaurants in that area – no cutlery, either! And a lot – a LOT – of food is bought in from factories. I realised this after a friend made me a curry from a ready meal – it tasted rich and buttery and EXACTLY like the curries I often ate in Singapore, maybe less spicy. Lime juice is often cordial, though a very nice one (you can buy it in London at some groceries in Brick Lane! ).This isn't meant to invalidate your experience or opinion (really hoping it doesn't come across as snotty, which is the hazard of this type of communication) – like I said there's foods and food places that were so delicious I still think of them sometimes (I moved away three or four years ago). But it's just meant to offer a slightly different take on the 'Singapore as gastronomical paradise' opinion I read so often. It's like anywhere else – really good. And really bad. And in-between. And ready-made kitchen shortcuts. Love your blog! I just included it on "10 Food Blogs You'll Love" http://www.travelinggreener.com/blogs/10-food-blogs-youll-love/ on TravelingGreener.com. Sounds like you had a blast! I'm envious, I have always wanted to go to Singapore. The food sounds amazing. Thanks for the post. Can't wait for the top 10! Gorgeous photos! 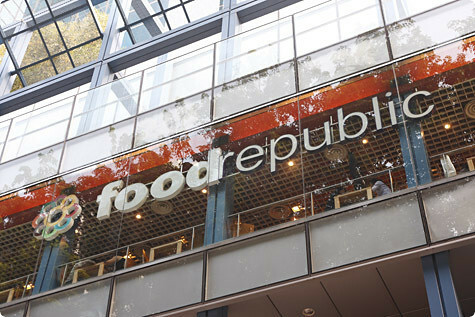 Singapore definitely looks like a foodie's paradise. Never been to Singapore but now it's on my places-to-go list! Thank you! Wow. What a plce!!! 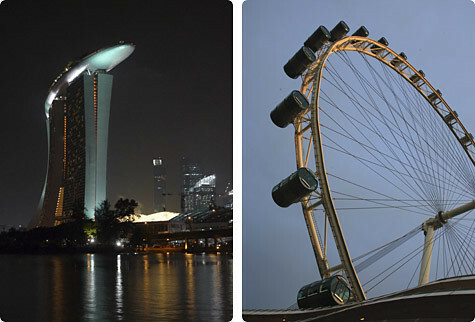 I love to visit singapore. Thanks for sharing this. Hi! It's my first time here. I like your blog and I enjoyed going through it. Amazing photos! I love the fluid mixture of food cultures – Arab quarter cooking a Pakistani/Indian speciality. Fascinating article and stunning photos. I'm a little late to your Singapore Fling but just reading this – and drooling! – now…Must either travel to Singapore immediately or replicate some of these in my kitchen!One note on the "Lime Juice" – kalamansi are Filipino limes…You note they're indigenous to the part of Asia Singapore is in…and being Filipino ; ), thought I'd rightfully credit the Philippines for this beautiful citrus!Keep eating and traveling the world!